As is so often the case in motor racing, fortunes change in an instant, from elation to crushing disappointment and back again. 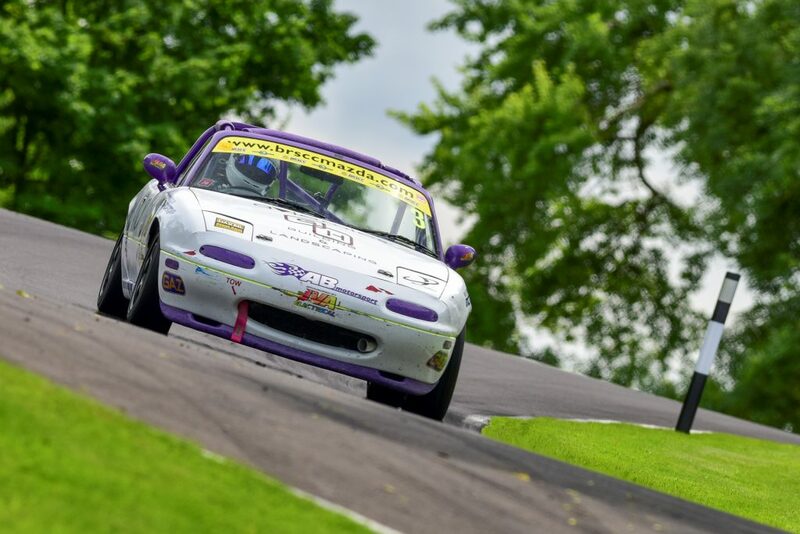 And so it was in mid July for Ben Tuck, when he continued his title challenge for the BRSCC Mazda MX5 Championship at the picturesque Cadwell Park circuit Lincolnshire. In a busy weekend, the first of 3 triple headers this season, Ben survived a blown engine and a broken gearbox, to finish up with fastest lap, a podium, a trio of trophies and 2nd on points in the Championship Standings. 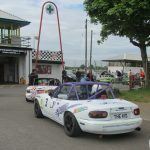 It was a weekend where Ben, yet again, had to demonstrate maturity, coolness and focus to drive around and accommodate issues, proving his worthiness to sit at the top of the 60 strong field of competitors in what is perhaps the most competitive and action packed single make Championship in the country. His mechanical woes began during Friday testing where his engine suffered a catastrophic mechanical breakage as he dialled in the car to the beautifully landscaped circuit. Not only did the team have to find and then fit a replacement engine, it also left Ben without the opportunity to scrub in a new set of tyres ready for race day. The knock on effect would be that if the engine was replaced then he would be facing a tough battle on race worn tyres. The team put in a gigantic effort and installed an engine loaned by one of Ben’s greatest rivals in the Championship, a generous and sportsmanlike gesture typical of the camaraderie amongst the top drivers this year. By qualifying on Saturday the engine was installed, and with no opportunity to test, Ben took to the track with an unknown amount of torque and power under his bonnet. By the middle of the 20 minute session Ben was on Pole trading fastest laps and as the session drew to a close he was able to maintain 3rd fastest. Adding the second groups results, Ben ended up posting the 4th quickest time overall, demoted to 6th on the grid due to the equalisation rules between the groups. On Saturday afternoon, in the first of the weekends 3 races, Ben maintained his start position off the grid and then began to reel in the leading pack as the race progressed on a drying track. After an intense battle during which Ben made a miraculous save from a half spin (see video below) he claimed yet another 4th place, his 4th of the season, whilst posting 3rd fastest lap of the race. But with the car much more settled and some experience of how to manage the engine and now with proven winning pace, Race 2 was to be for the big push. And so under bright conditions on a damp track Ben blasted away at the sharp end of the grid, intent on the podium. Another difficult start gave him some places to recover before mounting a charge on the lead. By lap 2 that job was done and he set about a 5 lap dual with the 3rd place man. With 5 laps to go Ben had claimed 3rd spot and began hunting down the current Championship leader for 2nd place, taking a tenth of a second a lap out of him. But the chequered flag brought the chase to an end and Ben took his first ever podium place in his 10th ever car race event, and 3rd fastest lap. Confidence now growing, a win was on the cards for the final race. After dropping a place on lap 1, Ben quickly recovered and settled into a relentless charge from 4th, drawing ever closer to the lead and taking what would be the fastest lap of the weekend for the second time this season. Passing the start on lap 5 in 2nd place Ben was pressing for the win, but on the back straight disaster struck, as his gearbox jammed in 3rd gear and then in neutral. Negotiating passing cars and 3 corners, Ben wrestled with the gears until he freed up 2nd and 3rd gears. After sliding to 5th place he set about managing his ailing car, keeping calm and chasing down and retaking 4th position. As he came across the line he knew that what could have been his maiden victory had been cruelly taken. However, overall a broken engine and gearbox had been converted into a podium, a weekends fastest lap, and 3 trophy positions by sheer determination and hard work by Ben and the team at AB Motorsport, qualities that are undoubtedly going to win Championships before very long.